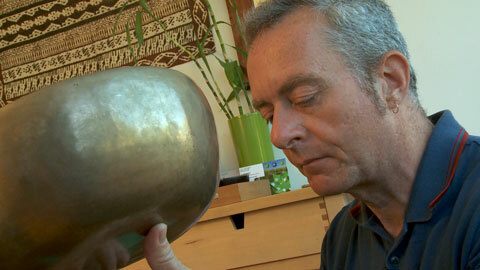 "I first came across Tibetan singing bowls in the Seventies", says Chris Shakallis. Soon he was using them - and bells, and gongs - to create music. Some time later, already an experienced massage therapist with a remarkable collection of bowls and gongs, Chris started experimenting using bowls as tools to achieve higher levels of relaxation during his massage sessions. "Their therapeutic effect has been well documented in research in Europe and, to a lesser extent, in the USA. It seems that they influence brainwave patterns... a person can be in, say, a beta state. We introduce these sounds, and brainwave patterns shift towards delta and theta - which is quite a deep state of relaxation, almost meditative. "Sound therapy also reduces the level of cortisol the body creates - the so-called "stress hormone". Some people come to Chris for a session entirely made of sound therapy. More often, they request a mix of massage and sound therapy.